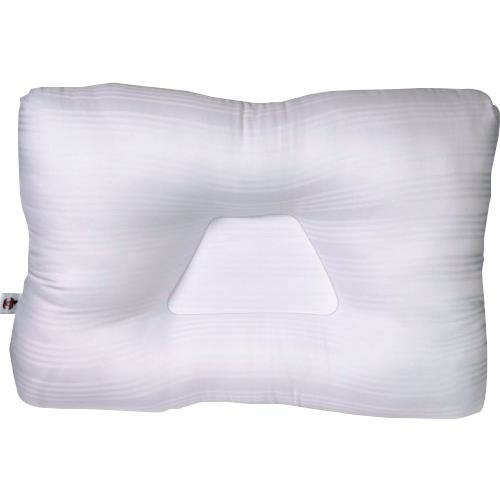 Core Tri-Core Mid Size Cervical Pillow helps alleviate neck pain and correctly align the spine, while supporting the neck in its natural position. The trapezoid-shaped center delivers great orthopedic benefits for back sleeping by cradling the head and allowing the built-in neck roll to firmly support the neck. Comfortable, but firm, side lobes support the head in a natural position when side sleeping. Allows for comfort and support. High quality fiber is blown to exact specification to insure uniform distribution and pillow weight. Originally used to emulate features of natural down pillows & used in comfort for accommodation. Advances in fiber have resulted in great ability to comfort & support. Core Pillows use conjugated fiber which acts like a spring. During manufacturing, high pressure will link fibers together & different resiliency levels can be created in the pillow. This process helps fiber stay in place and resists migration, yielding consistent support as fiber generally has amorphous tendencies and can clump or rat tail during cleaning. Foam can offer the most consistent support but Fiber currently can offer almost as much but with more comfort. Fiber material is available in wide array of sizes, shapes & coatings. Has ability to perform as either a semi-solid or semi-fluid. Polyester fiber has natural flame retardance and durability. Soak in lukewarm water using mild detergent. Continue to press or flush water though untill clean. Rinse in clean water removing detergent and soil. Press out excess water and drip dry flat. Do not hang or filling will settle. Refluff when thoroughly dry (punching action on diagonals). Tri-Core pillows are beneficial to those who sleep on their side as well as for back sleepers. Tri-Core pillows’ unique trapezoid center cradles the head and supports the neck to help align the neck and the head in their proper positions. Because the cervical curve is supported in its neutral position, using Tri-Core pillows helps to correct nerve malfunction and promotes healing of injuries. More importantly, Tri-Core pillows promote good health while providing maximum comfort by preserving the normal curvature of the neck and spine. Two different sized lobes provide better fit for different sized sleepers. Bottom: Smaller Neck Support Top: Larger Neck Support Side Lobes are taller than the trapezoid center, to accommodate side sleeping.